The Charisma 555 provides a stylish, comprehensive holiday solution with a relatively light GVM enabling it to be towed by vehicles in the two-litre range. The interior layout of the Swift Charisma positions the heavy components directly over the axle, contributing to its excellent weight balance characteristics. The layout, colours and curtains provide a comfortable, spacious feel. The two-litre turbo diesel VW engine could easily manage a run up to the open speed limit. The all-up weight of a suitable tow wagon plus the Charisma will be well under the 4500kg threshold over which the driver requires a Class 2 driver’s licence. The Charisma looked well balanced, crisp and ‘cutting edge’, with a sense of urgency that said, "Let’s get going". 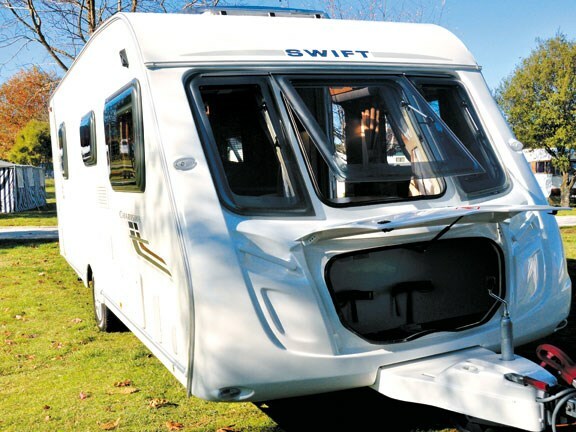 Swift Caravans fits a one-piece moulded GRP rear panel and aerodynamically efficient front panel to all models it produces. The flat side panels (25mm thick), the roofs (32mm) and the floors (45mm) are of bonded construction. This construction method contributes to making the finished product lightweight and well-insulated. 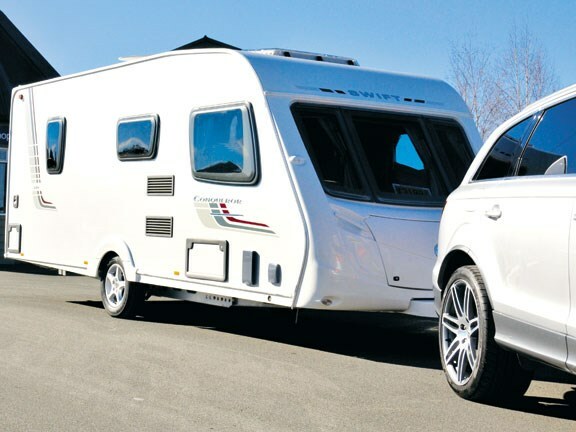 The tare weight is 1269kg and the GVW is 1480kg, which is light for a six-metre class caravan. The Charisma range is fitted with an Al-ko Vario ll, hot-dipped galvanised steel chassis, an Al-ko Euro axle and an Al-ko AKS 3004 anti-sway tow hitch. The Euro axle, specially designed for the caravan industry, is a variation on the torsion bar type and, with its low unsprung weight, has excellent suspension and stability characteristics. The tow hitch is the Al-ko AKS 3004, with built-in sway dampening. 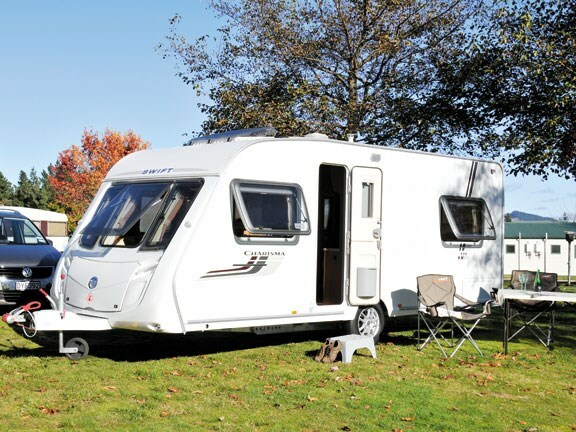 The Swift caravan has a large front locker – long enough to house awning poles, a small BBQ, table and chairs, as well as being the permanent home for two 9kg LPG bottles. The windows are frameless double-glazed acrylic and open ‘awning-style’. They have lock knobs on the stays and a have a constant ventilation ‘night time’ setting. They are all fitted with an interior cassette that contains an insect screen and reflective blind. Storage space under the double bed can be accessed through a kerbside hatch. The house battery is in a locker on the driver’s side at the front of the caravan, which also houses the 240-volt inlet plug. There is an awning track on both sides of the Charisma, offering an alternative layout option in tight situations. 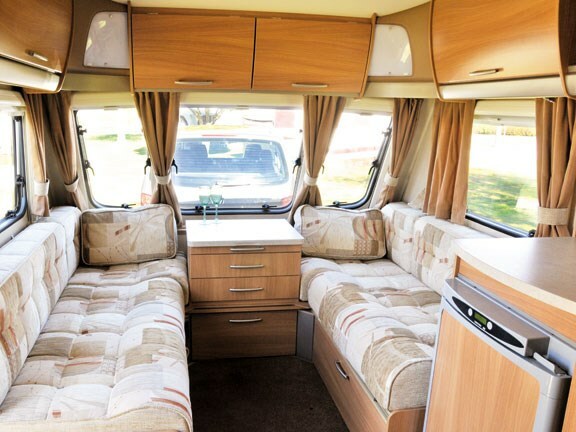 The Swift layout has the twin settee lounge at the front, kitchen opposite the entrance, and toilet/shower cubicle at the rear on the driver’s side with the permanent double bed alongside. 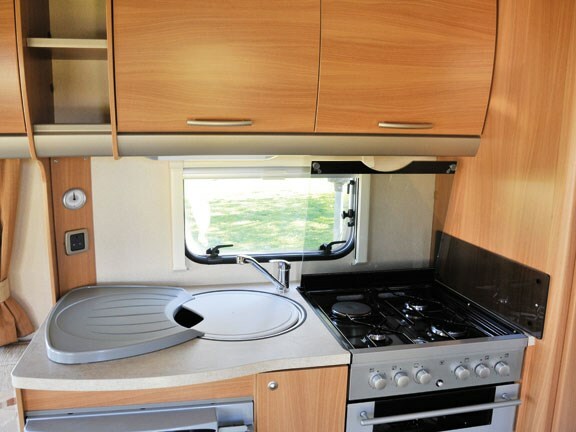 A benefit of this interior layout is that it positions the heavy components like the fridge and oven directly over the axle, which contributes to the excellent weight balance characteristics of the Charisma. The 1600mm long lounge settees could serve as twin singles for children. There is an extending tabletop on the cabinet between the settees for casual dining for two. A larger freestanding table is also provided. 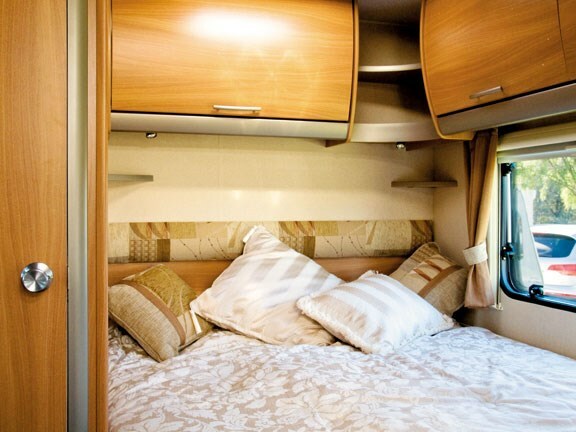 In the overhead locker above the settees (and throughout the caravan) Swift has replaced timber components in the cabinet frames with moulded plastic components that are both stronger and lighter. Two benches, one each side of the caravan, make up the kitchen working space. The sink bench houses the oven, and the Dometic electronic ignition, digital control, 107-litre fridge/freezer. The oven has three gas hobs, one 800W electric hob and a separate gas grill. There is a ceiling vent above and a window behind the hobs providing more than adequate ventilation. The bathroom arrangements are practical – you step across the shower tray to use the Dometic swivel toilet that is protected at shower time by a full-height folding screen. All the essential fittings are there – a clip for the shower handpiece, a shelf for soap/shampoo, clothes hooks, a handrail, a light and a ceiling hatch. The bedroom can be screened off from the rest of the interior by a folding door. The hanging locker is beside the hand basin and three large overhead lockers await folded clothes and personal items. A side window and ceiling hatch provide ventilation and light. The bed has a 1920mm x 1380mm inner sprung mattress and for extra comfort it rests on a beech slat base. Gas struts assist raising the mattress and base to access the storage beneath. The unladen Charisma has a tow ball down weight of 53kg, and taking reasonable care when distributing the payload the loaded tow ball weight would easily be adjusted to between 75kg and 90kg. The all-up weight of a suitable tow wagon plus the Charisma will be well under the 4500kg threshold over which the driver requires a Class 2 (heavy vehicle) driver’s licence and COFs replace WOFs as the legal requirement. The Swift Charisma 555 retails for $47,995, plus on-road costs of $1880, which includes a limited five-year warranty.